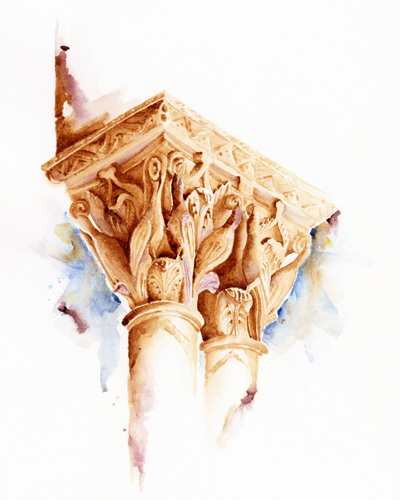 Birds captured in stone ornament an elegant open air cloister. Indeed there is much symbolism in this. And though words have been written in books, telling of their meaning and design, isn't it so much more enjoyable to reflect on it for oneself? Thoughts of freedom and flight while retaining a sense of solidarity and strength come to mind. Perhaps being here takes one to this place within oneself...A place of hope and longing to be somewhere distant and unknown while being firmly grounded within. A journey, a flight to a place whose beginning and end both lie within oneself. If you enjoy my writing and art, be sure to subscribe to my watercolor email journal here. It is there that I share works and my process largely hidden from the online world. You will also hear of the launch of my online shop.